What do pancreatic cancer, lung cancer, breast cancer, and testicular cancer have in common? They all sound very much straightforward. Pancreatic cancer means cancer in the pancreas, lung cancer is cancer in the lungs, and so forth. And then you have leukemia. At first sight, no one could immediately know what leukemia meant, or even if it is a cancer or not. But in fact, the word ‘leukemia’ comes from the Greek words leukos (which means white), and haima (which means blood). 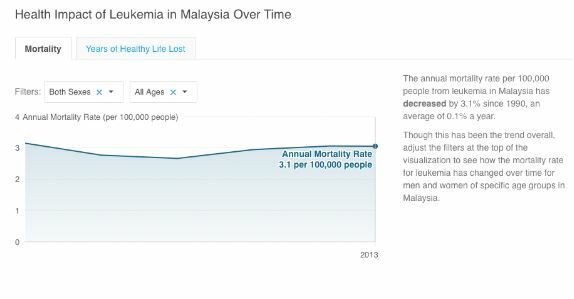 Here’s more information about the state of leukemia in Malaysia. “Leukemia is a cancer that starts in blood stem cells. Stem cells are basic cells that develop into different types of cells that have different jobs. Blood stem cells develop into either lymphoid stem cells or myeloid stem cells. Lymphoid stem cells develop into lymphocytes, a type of white blood cell. 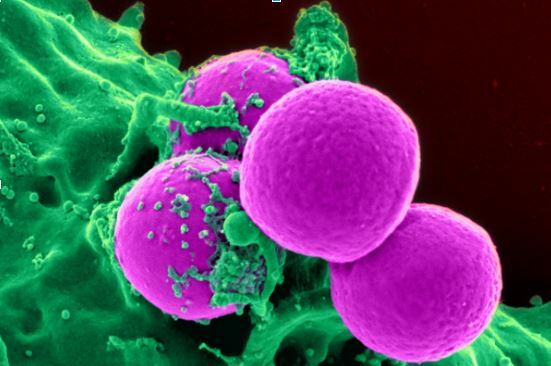 Lymphocytes help fight infection and destroy abnormal cells. The 3 types of lymphocytes are B cells, T cells and natural killer (NK) cells. Myeloid stem cells develop into red blood cells, granulocytes, monocytes or platelets. Red blood cells carry oxygen to all tissues of the body. Granulocytes and monocytes are types of white blood cells that destroy bacteria and help fight infection. Platelets form clots in damaged blood vessels to stop bleeding. At this point, if you are concerned about getting leukemia and would prefer some financial protection against any potential treatment in the future, look no further than the AXA Cancer Care insurance policy, available nationwide in Malaysia! For simple and easy descriptions of what this policy could offer you, visit our spanking new PolicyStreet website here for the latest cancer insurance, including leukemia in Malaysia! 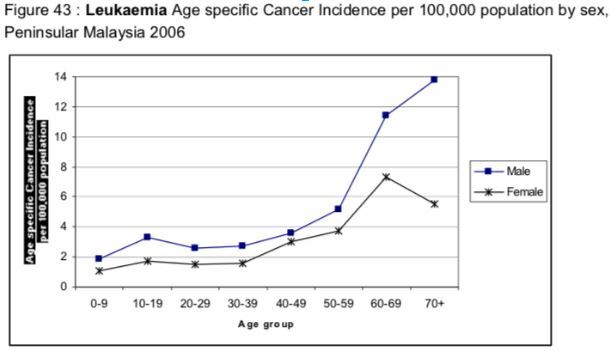 In Malaysia, the 2006 statistics by the Ministry of Health show that about 3 to 4 people get leukemia per 100,000 of the population. The risk of incidence is higher for males than females. Children are also more at risk especially when they are in the age range of 10-19. In this age range is where 20% of leukemia patients are. But despite this glaring age range that seems to frighten parents, it is adults who should worry more for themselves. Furthermore, as you grow older, the risk of incidence also increases. But between men and women, men develop higher risks when they’re old, while the risk of women getting leukemia lowers around the age of 70. 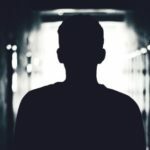 If you have heard of a friend who suffers from leukemia and would like some extra support for yourself in the future – JUST IN CASE – then look no further than the PolicyStreet website as it offers all that can meet your insurance needs online (yes, even cancer insurance like leukemia in Malaysia with zero agents. When leukemia develops, new blood cells that are damaged by cancer can overtake bone marrow, and so make it difficult for healthy cells to grow, because you have fewer healthy cells. Plus you could develop anemia from then on, which can lead to pale skin. Fatigue is a common symptom of leukemia. So if you’re feeling wiped out all the time, and especially if your lack of energy is a noticeable change from how you used to feel, tell your doctor. Your blood cells are an important component of your immune system. If they’re unhealthy, as is the case for those with leukemia, you can expect to get sick more frequently. Infections or fevers are one of the most common symptoms we see. Such as fatigue, pallor, and a general feeling of illness. This includes bleeding from the gums or nose, or blood in the stool or urine. This could be as simple as asore throat or as serious as bronchial pneumonia, which may be accompanied by headache, low-grade fever, mouthsores, or skin rash. This typically happens in the throat, armpits, or groin. You could actually feel for them. 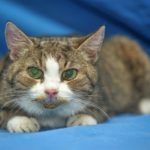 Stopped feeling like eating? Maybe it’s not just the food being bad. This would be caused by a swollen spleen. Spleen? Spleen! Sounds funny to say right? SPLEEN. Okay enough. This could be due to retinal hemorrhage, ringing of the ears (tinnitus), mental status changes, prolonged erection (priapism), and stroke. Cancers are generally in the range of tens to hundreds of thousands. One of the more expensive cancers to treat is actually breast cancer, which could go up to RM400,000. Looked upon this way, leukemia is at a fairly modest sum of RM35,000 to RM85,000. This figure was obtained from an alternative treatments website called Cancer Cure Malaysia. 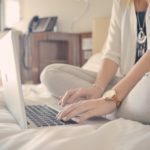 Other community blogs such as Cancer Care Malaysia tells the story of failed chemotherapy treatments. These stories claim that the costs of leukemia go beyond the sum of RM100,000, and this would mostly depend on whether the chemotherapy worked in the first place. To treat leukemia, you would probably need a specialist and this will be very costly. A safe bet to find specialists in blood cancer a.k.a. Leukemia in Malaysia would probably be in private hospitals such as Gleneagles, Pantai Hospital KL, or even Prince Court. More affordable options would be from examples of government, or even NGO initiatives such as those detailed in this article. 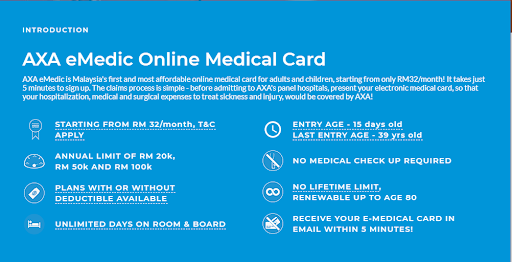 AXA eMedic is Malaysia’s first and most affordable online medical card for adults and children, starting from only RM32/month! It takes just 5 minutes to sign up. The claims process is simple – before admitting to AXA’s panel hospitals, present your electronic medical card, so that your hospitalization, medical and surgical expenses to treat sickness like cancer, would be covered by AXA! Medical costs would not be so exorbitant if cancer is detected earlier, therefore the sum insured offered by eMedic could be a good starting point to cover early stage cancer detection and treatment.